In the recently released Business Reform Action Plan (BRAP) 2017 by the Department of Industrial Policy and Promotion (DIPP), CII Western Region states, in general, have shown a commendable performance with Gujarat, Madhya Pradesh and Maharashtra scoring 97.99%, 97.30% and 92.88% respectively, in the implementation of business reforms. Goa, scoring 57.34%, did well in improving its performance from last year when it had managed to score only 18.2%. Such a good performance of western states, coupled with the presence of highly-skilled labour force, natural resources, and market connectivity, augurs well for the future of investment climate in the region. Gujarat, Madhya Pradesh and Maharashtra have been amongst the top achievers in several parameters of ease of doing business, reflecting strong commitment in streamlining the regulatory processes and procedures for reducing time and money costs. One of the key features of BRAP 2017 is that it also takes into account the feedback from actual users of business reforms, besides those from the state governments / UTs. Large gaps are found in the scores based on states’ responses and users’ feedback, indicating the difference between implementation and delivery of reforms. Notable gaps are found in the case of Maharashtra and Goa. As against 97.29% reforms implemented by Maharashtra, the state scored only 50.29% on feedback from users. Similarly, Goa, which scored 61.5% in implementation of reforms, managed to score only 14.12% on the feedback score (Table 1). The task for the western states, especially Maharashtra and Goa, is cut out for the next year in terms of the need to strengthen the delivery of reforms at the ground level. 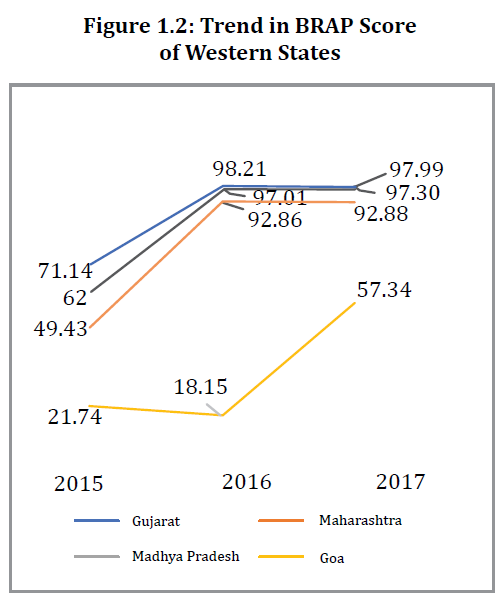 While western states have been registering high BRAP scores, three major states – Gujarat, MP and Maharashtra – have witnessed a regular deterioration in ranking in the last 3 years. 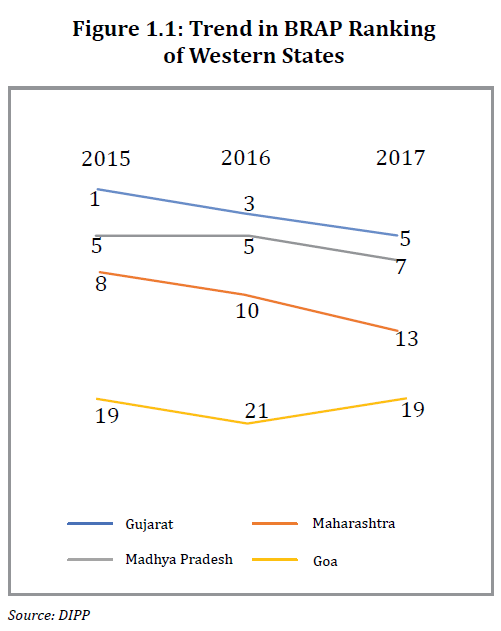 The sharpest decline is witnessed by Gujarat from 1st in 2015 to 5th Position in 2017 and Maharashtra (from 8th in 2015 to 13th position in 2017). These states, therefore, have to do more not only in absolute terms but also in relative terms of the ease of doing business performance (Figure 1.1). Gujarat has also been recognized as the best practicing state in the parameter of Environment Registration Enablers. Various facilities, like the Xtended Green Node (XGN), online e-governance management system, provision for Common Consents & Authorization (CCA) with longer validity, risk-based inspections, online application for environmental registrations & renewals and so on, are being provided to remove physical touch base, reduce compliance time and costs. Madhya Pradesh, another major western state, has been recognized as one of the most industry-friendly states. It has been pro-active in providing varied provisions and a conducive environment to the investors. The state has been specially recognized in implementation of reforms in the areas of Inspection Enablers, Labour Regulations and Online Single Window System. Madhya Pradesh Trade & Investment Facilitation Corporation (MP-TRIFAC) is the Single Window portal of the state. The portal provides a mechanism of Integrated New Venture Establishment (INVEST), encompassing the full cycle of an investment proposal. Other provisions available on the portal include Investor Wizard (Common Application Form), comprehensive list of approvals under various departments, Grievance application tracking, Incentives processing & disbursal and so on. Maharashtra, one of the key states in the westerns region, has also introduced a range of reforms in areas such as labour regulations, obtaining utility permits and the online single window system (MAITRI). These reforms have helped in attracting large investment in the state. The major challenge for the state lies in strengthening the delivery of reforms for users. Goa is one of those states that have achieved a big leap in terms of improvement in reform implementation. Goa has made some notable progress in the parameter of Paying Taxes, Environment Registration, Labour Regulations and Access to Information. The state has also assured the investors that Goa would soon be amongst the top Indian states for doing business with continuing momentum of reforms. Thanks to the impressive performance of western states in ease of doing business, the region continues to attract high volume of FDI and Investments. We need to have a sustained and effective programme of ease of doing business to take this to the next level. CII would continue to work with state governments of the western region in implementation as well as delivery of business reforms. CII aims to collaborate with the state governments for conducting detailed studies to identify gaps in implementation of reforms and suggest the way forward. In sum, the western states with business friendly policies, stable law and order situation, and adequate inputs availability offer great potential as the leading manufacturing hubs. Further, continued implementation of business reforms have added to the advantage. The need of the hour is to strengthen the industry government partnership to provide an impetus to these fast-paced reforms and improve the attractiveness of the western region as an investment destination.